In the early 1600s, the Navajo learned weaving from their Pueblo neighbors in what is now the Southwestern U.S.. It was men who mastered first mastered this skill, although women eventually absorbed the task. Weavers in the U.S. Southwest used wooden looms, sheep's wool, and natural dyes to make hand-woven blankets that were used in everyday life as cloaks, covers, and saddle blankets, among other items. Throughout the 1700s, Navajo textiles became a major commodity in trading with the region's other indigenous groups, as well as the Spanish and Europeans. Over time, weaving techniques improved, patterns became more elaborate, and Navajo textiles came to be desired for their aesthetic value. As the market developed, blankets became interchangeable as rugs and were valued as decorative, rather than utilitarian, pieces. Today hand-woven Navajo rugs are highly prized and are often purchased by wealthy collectors to be hung on the wall rather than used as the daily objects they originally were. 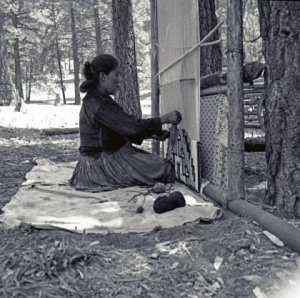 "Woman weaving, Navajo Reservation, NM, 1952," photograph by John Collier, Jr.. Farmington Museum, Farmington, NM. All Rights Reserved. Use with permission only.